The story is about coping with life impacting change something that can happen planned [as in a house move] or completely unplanned [as with a natural disaster, accident, death etc]. Coping with change, as child/family psychologists and counselors all say, is something that has a profound impact, especially on the young. As with grief, adults are often too preoccupied with the change and its ramifications to be able to take in how the children, who are being impacted by change, are managing or not managing in the new setting/situation. The cat in the story moves, accidently, from one environment & family on a farm, to another very different one, aboard a fishing boat. He is then impacted further by the loss of a master he has come to love. But this is not the end. He moves through his life’s dramatic changes; firstly, by grieving, something we need to encourage each other and especially children, to do. He then reaches out to, shares with and cares for others also affected by loss, in this case, the fisherman’s widow. He gradually accepts his new life situation, not for a moment forgetting what has happened, but treasuring the wonderful memories he has. The process of grieving must be acknowledged and the grieving child/adult be allowed to express their grief or sense of loss at the change in their lives and encouraged to do so. Let them talk, let them share as much as they need to. Highlight the constructive aspects, positive elements, e.g, wonderful memories of a dead friend, relative or pet. If the impacting change has involved a move – be it to a different school, to another suburb, another state, another country – encourage the keeping of contacts where possible, assist with the making of new contacts and the sharing of the process of moving and resettling, especially any humorous incidents. The hope in writing this book, was to help children talk about their own stories of life changing events and to recognise, that whilst change is not always pleasant, we can become stronger for it and be better able to reach out and empathise with others experiencing its many faceted impact on their own lives. The Sea Cat Dreams is a beautifully written and illustrated book for children. In today’s world with so many young people facing loss and change, this important resource supports a child’s journey through grief and separation. I am adding it as a good resource in my new book, the third edition of “Life and Loss”. Fellow in Thanantology: Death, Dying, and Bereavement (FT), MS degree Counseling, Master’s Equivalency in early childhood education, LCPC and NBCC. She worked as a teacher and counselor in the school system for almost twenty years. I’ve just lost a dear friend to cancer and I felt refreshed after reading the Sea Cat’s Dreams story. I found myself identifying with the Sea Cat in the story and this metaphor provided a comforting space from the painful loss, but it also normalized it. Like the cat’s life, our life is often interrupted by hurtful events. Through the cat’s eyes I witnessed my sorrow and of those around me but in the midst of it all there is a safe, calm place on our heart’s sill where we know we shall be well, allowing the sorrow to run its course while cherishing the memories. I would definitely use it with my clients, young and old. 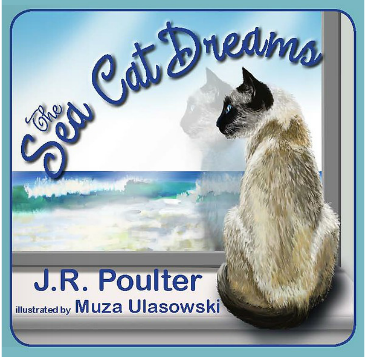 The Sea Cat Dreams is the latest bibliotherapy book penned by JR Poulter. The story, recounted in beautiful poetic form, centres around the life transitions of a cat and the devastating loss it has to bear, rendering it a very versatile bibliotherapy tool which can be used with children who have experienced different types of life transitions including change and loss in different dimensions. The slogan for the book is “Coping with change…” and this is an apt choice as change is paradoxically the constant in the cat’s life resulting in losses borne on lots of levels. The losses associated with the first transition in the cat’s life pale into insignificance compared to the devastating loss associated with the second and this bears out the author’s sensitivity to different losses having different impacts. The contrast is rendered starker by the positivity of the first transition in the cat’s life and this also shows awareness on the author’s part that not all life changes are unsettling. These observations lend further testimony to the nature of the author’s outlook on life which is both realistic and positive and shines through her work. Poulter focuses on coping with change and all its ramifications. She highlights the relational aspect of coping with bereavement in caring for and comforting one another and gives prominence to the importance of memories and fantasy in coping with changes and loss. The book is illustrated by Muza Ulasowski with delightful romantic imagery in hues that evoke comfort and warmth, blending seamlessly with the overarching theme of resilience in the face of tragedy. The Sea Cat Dreams is a book I would wholeheartedly recommend. Claire Casha is a psychology graduate with over ten years’ experience of family therapy work. She is currently working as a research officer and reading for a Master in Family Studies at the University of Malta. “GRIEFABET” by Karen O. Johnson, MEd. GRIEFABET by Karen O. Johnson MEd. 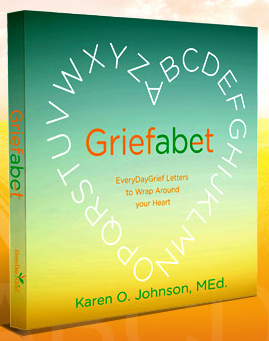 “Griefabet” by noted American therapist/counsellor/presenter, Karen O. Johnson is unusual. The book,of course, is primarily aimed at counseling and therapy settings and there is a workbook that can be purchased to accompany “Griefabet”. But this little book is a great deal more. A book of warm, witty, affirmations for those who are coping with grief and loss, it has a few happily playful ‘venting’ exercises thrown in for good measure. It is also a free verse poem that celebrates life and the resilience of the human spirit. 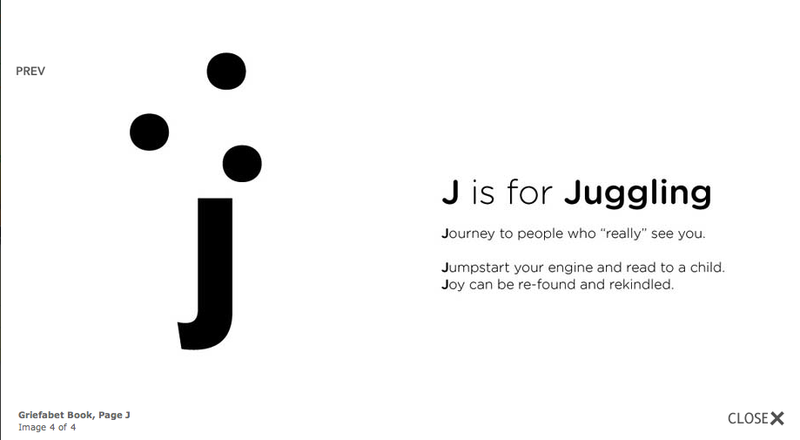 Finally, it is a work of art – illustrations use the letters of the alphabet in designs that mirror the verse of affirmation opposite. It is a design achievement! “GRIEFABET” by Karen O. Johnson, http://www.griefabet.com, ISBN 978-0-615-39746-7.